Published Aug 13, 2013 by Peachpit Press. Part of the Learn by Video series. 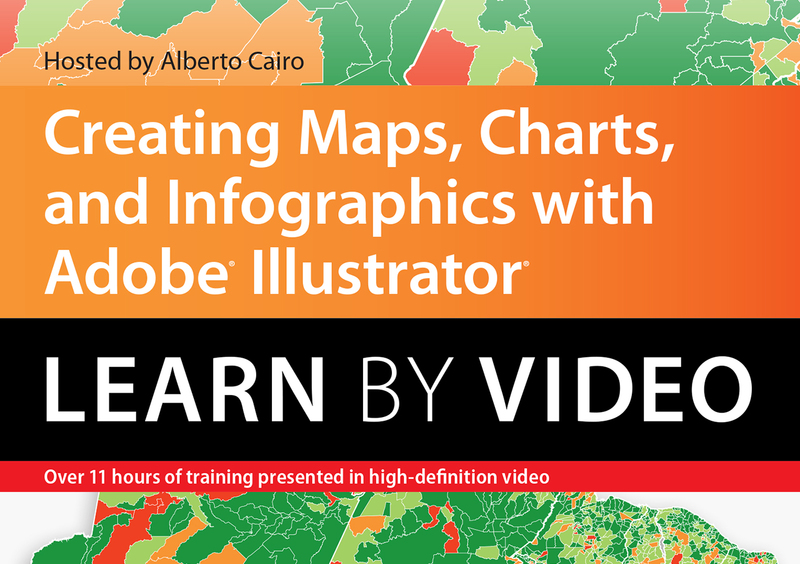 Learn how to create infographics, maps, and charts in this 12-hour, video based course to teach anyone who can hold a mouse how to use Adobe Illustrator to tell stories with data. Get a foundational overview of Adobe Illustrator’s key tools, palettes, and panels. Learn how to create, transform, and style text as well as several types of shapes. Use grids and Illustrator’s alignment tools to create a solid structure for your compositions. Learn to mask objects and photos and arrange a layout in which to place images and text for your infographics. Use Illustrator’s Graph tool to design data maps and make your graphs look professional. Learn how to effectively use the Pen tool, arguably the most important tool in Adobe Illustrator when it comes to drawing anything. Combine different shapes into one with advanced tracing techniques using Illustrator’s Pathfinder tools and learn how to design a locator map based on copyright-free sources. Design a step-by-step explanatory graphic based on complex vector illustrations of hands, arms, and objects. Learn how to create realistic shadows on objects using a broad variety of tools and techniques and how to create and store color palettes and apply them to complex illustrations. Simulate three-dimensional (3D) effects in Illustrator and learn to draw infographics in isometric perspective.